It's rare for me to visit the Sunseng market, mostly because it's parking lot is an absolute nightmare and I can find a lot of the same products at the less deadly H-Mart and Asian Food Market, but once and a while they carry a few things that I can't find anywhere else. I've had plenty of Tao Kae Noi seaweed products from the other Asian groceries, but their flavor variety leaves a lot to be desired. I can find curry, or wasabi, but Sweet Chilli Squid? This was a flavor I'd only seen online, so already the trip to the deadly Sunseng market was worth it. This bag is a LOT to take in. We've got a starburst shape, the image of a sizzling grill with some seaweed strips, bright colors, metallic accents, that chunky logo, and a tiny little emoji-looking squid character. The business isn't contained on the front of the package either. The back is busy too! As far as the design is concerned, I don't hate this, but there's no place on this entire package for my eye to rest. It's like a visual representation of ADHD. All of these components are appealing and eye catching on their own, combine them all together, and it's overwhelming! Another thing I want to point out is that this bag was SUPER PUFFY. You can kind of see what I'm talking about in the back-side photo, this thing was filled with air! Way more air than the other flavors of seaweed I've reviewed. I was kind of worried that when I opened it there wasn't going to be that much product inside, but thankfully, it was pretty densely packed and the added air prevented the sheets from getting destroyed in their travels. 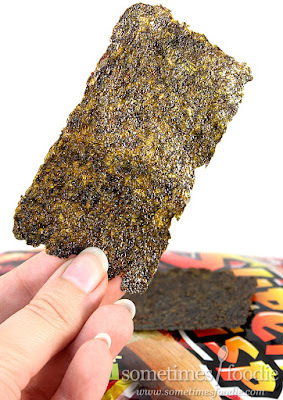 Once opened, the seaweed sheets smell ocean-y with a hit of Teriyaki-like seasoning and not fishy (or squidy) at all! It's kind of sweet and BBQ-sauce like, but mild. The main aroma is that fresh ocean-y smell that all seaweed has. I took one bite, and I was instantly in love. These are delicious! The seaweed is a bit thicker than my usual seaweed snack of choice, but that's to hold up to whatever flavoring they basted/sprayed on here. Since this is a bit thicker, it has a really satisfying crunch to it that I can't get enough of, and the flavoring is the perfect mixture of sweet and spicy to keep me coming back for more. This sauce/coating reminds me of takoyaki sauce, so it's kind of BBQ-like and a little smokey, but it has the sweet and spicy burn of sweet chili sauce, and a hint of artificial crab meat. I may not be the most adventurous eater out there (I'm letting you all know right now there is never going to be a bug-based food review on this blog) but I've eaten my fair share of squid. 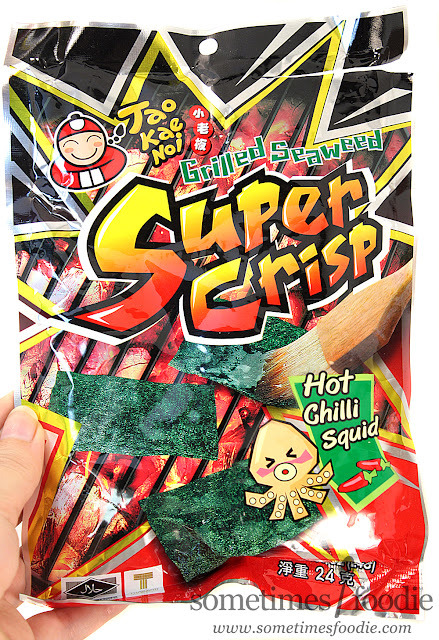 I've had BBQ squid, squid-based sushi, squid flavored chips, and by comparison, this doesn't taste like real squid to me. This has that same generic seafood-y flavoring as those Tako (octopus) chips I reviewed a few years ago, Which is not a bad thing at all! I LOVE these! If you like sweet chili sauce, this is the seaweed for you. 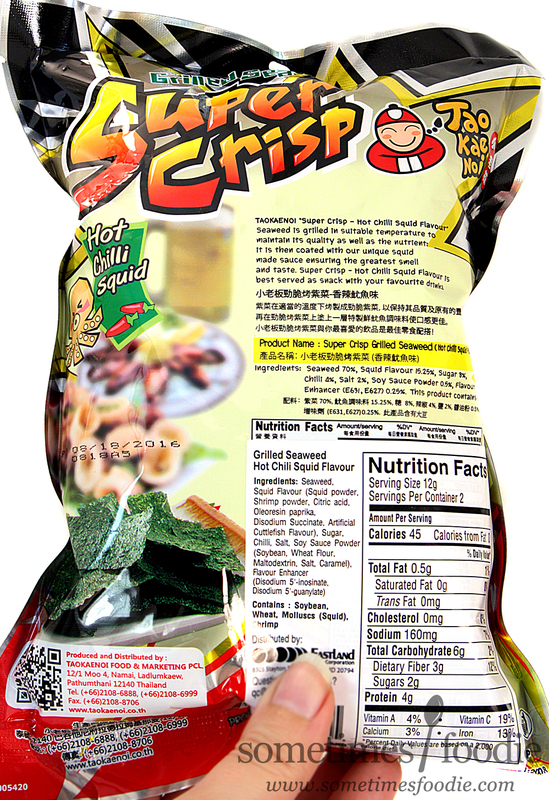 I understand that the squid-aspect might scare a few less adventurous consumers away, but trust me, these aren't that squid-y at all, and if you enjoy crab meat, or imitation crab meat, these are definitely worth a try. I absolutely love these and easily ate the entire bag once it was opened. This is easily my favorite flavor of Tao Kae Noi brand seaweed snacks, and it might have to brave the dreaded parking lot of Sunseng to grab a few more bags.